By William Sunners. You can create and sell crosswords of all kinds, including puzzles for children, rebuses and acrostics as shown in this hardcover book. Includes a list of over 100 specialized publications that buy crosswords. By a master wood-craftsman, C. W. Brazille. 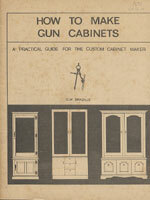 A practical guide for the custom cabinet maker. Learn its history, how to get started, work with stamps, U.S. stamps, topical collections, how to buy and sell, stamp clubs, and magazines. Stamp Collecting for Beginners is a complete guide to getting maximum enjoyment, maximum satisfaction, and maximum profit, from collecting stamps. You will learn how to identify, mount, and arrange stamps, how to know if a stamp is priced right, and how to recognize a great find. You will be intrigued as you learn how each stamp tells a story, recalls history, and is a unique work of art. By Burton Hobson. Paperback, (1986), 144 pgs. ...For Beginners. Learn about the beachcomber and his collection, the plants, sponges, corals, shells, fishes, reptiles, and mammals of the sea. Highly fascinating hobby and profitable fun activity. Over 70 scrap board illustrations. By Hicklin. This book tells you exactly how to go about searching for YOUR family roots. How to get started, keep records, write for all kinds of documents and records, and much more! This is a must read for those interested in finding more about their family background! A big 8x11" book by Ron Playle. Very easy to read and understand, this valuable guide will provide a handy reference for years. makes it so interesting is the search to find our family history. as most of us don't have famous ancestors with books about them. and get photocopies for a small fee. rewarding experience. As you follow the story of your ancestors as they emigrate from one place to another, experience hardships, achievements, loves, births, deaths, etc., it will be as fascinating as anything you've seen on TV .or in the movies. SEND FOR YOUR BOOK TODAY! A fun and instruction book in art with a series of different figures and poses which you fill in and finish. Follow the simple instructions and before you know it, you know how to draw figures amazingly. A really fun wan to learn how to draw. Kids and adults alike can benefit from the drawing techniques. For the beginner in art, with a taste and possibly a talent for figure drawing, this little book will prove to be a welcome companion and instructor. In drawing or painting a figure, the first step is to outline, in simple lines, the position and movement of the figure. That is done just as simply as possible, and as you will see in the numerous manikin sketches in this book. Any conceivable position, pose or action can thus be outlined. Then, the artist draws the features, the hands and feet, also any clothes that are indicated. Finally, the artist adds the finishing touches - the last, detailed, careful touches, shading and accessories to the figure. The first few pages of this book will show how it is done. Thereafter, there are a series of manikin studies, each in a different position, which the student artist can use as the beginning for a finished drawing. "If your ambition is from the heart, you will choose to live your life your own way. Since you are not in competition with anyone, you cannot lose, and you cannot hurt anyone. The world will become a better place just because you are contented to be you only, and not somebody else. Many of the world's troubles are caused by people who are discontented, people who are dissatisfied with being themselves, people who always expect more from everything."